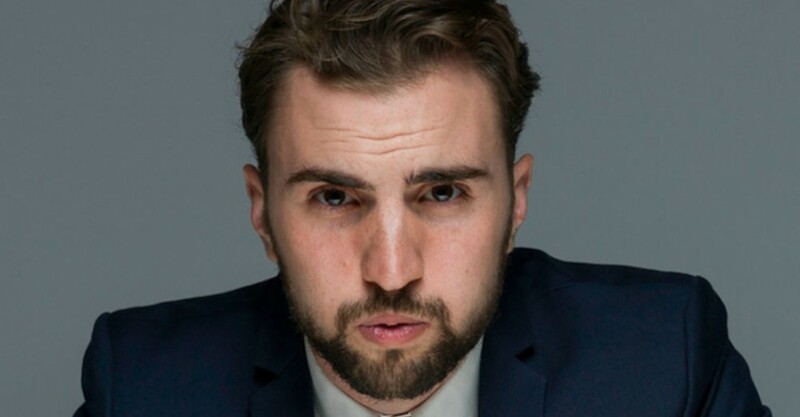 Simon Taylor is a captivating comedian that will ensure you leave with a massive smile on your face. A performer of this calibre deserves bigger venues with a huge audiences as he is just as funny as most of the more famous comedians in The Garden of Unearthly Delights. Two main themes were carried through tonight’s performance. The first being Simon’s fascination with language, which included commentary on the accents and diversity of the English language that is spoken in Australia, like the inflection on the end of every statement making it sound more like a question. He was hilarious in his description of his family’s progression from speaking Italian, to broken English to the accent of many Italian-Australian males today. The second part of the performance concentrated on Simon not exactly fitting the alpha-male stereotype, but having characteristics of what he calls a beta-male. He has a small skinny frame, has perfected flashy dance moves, dislikes beer and struggles to fit-in outside a big city. With inspiration from his Disney Karaoke CD that was stuck in his car stereo system, Simon gave a memorable rendition of Part Of Your World (The Little Mermaid) with lyrics changed to vent his struggles not being a true alpha-male. Simon Taylor is an outstanding stand-up comedian who comedy fans need to look out for. He is a brilliant natural storyteller who makes his audience feel comfortable and joyous through his relaxed connection with them. Simon Taylor – Human continues at The Garden Of Unearthly Delights – The Spare Room from 8.15pm until Sun 13 Mar. The Garden Of Unearthly Delights – The Spare Room, Sun 14 Feb Simon Taylor is a captivating comedian that will ensure you leave with a massive smile on your face. A performer of this calibre deserves bigger venues with a huge audiences as he is just as funny as most of the more famous comedians in The Garden of Unearthly Delights. Two main themes were carried through tonight’s performance. The first being Simon’s fascination with language, which included commentary on the accents and diversity of the English language that is spoken in Australia, like the inflection on the end of every statement making it sound more like a question. He was hilarious in his description of his family’s progression from speaking Italian, to broken English to the accent of many Italian-Australian males today. The second part of the performance concentrated on Simon not exactly fitting the alpha-male stereotype, but having characteristics of what he calls a beta-male. He has a small skinny frame, has perfected flashy dance moves, dislikes beer and struggles to fit-in outside a big city. With inspiration from his Disney Karaoke CD that was stuck in his car stereo system, Simon gave a memorable rendition of Part Of Your World (The Little Mermaid) with lyrics changed to vent his struggles not being a true alpha-male. Simon Taylor is an outstanding stand-up comedian who comedy fans need to look out for. He is a brilliant natural storyteller who makes his audience feel comfortable and joyous through his relaxed connection with them. Bobby Goudie Simon Taylor – Human continues at The Garden Of Unearthly Delights – The Spare Room from 8.15pm until Sun 13 Mar. Book at FringeTIX on 1300 621 255 and adelaidefringe.com.au. Click HERE to purchase your tickets.